Discussion in 'Femmes' started by etoilerouge, Oct 12, 2009. I searched several times and couldn't find a thread for her, so of course I had to start one. I think she's absolutely stunning and would kill for her hair! She's half Argentinean and half Japanese. Some people say she's the Gisele of Japan. That's her Facebook: It has a lot of pictures and updates! "Jessica Michibata (道端ジェシカ), born Jessica Celeste Michibata on October 21, 1984 in Fukui Prefecture, Japan is a Japanese fashion model. She was born to an Argentine father of Spanish, Italian ancestry, and a Japanese mother. She has been active in the modeling world since her early life. She has an older sister named Linda Karen and a younger sister named Angelica Patricia Angelica, both of whom are also fashion models. Jessica and Angelica are both spokesmodels for the lingerie brand Peach John. Jessica is fluent in English and Japanese. 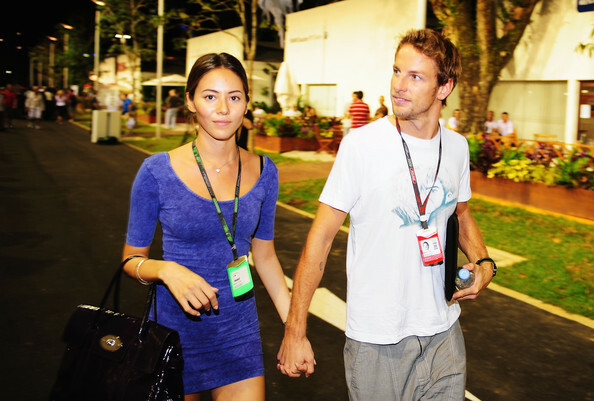 She is currently dating Formula One driver Jenson Button." Although as a child she had bizarrely set her sights on a career as a coroner ("That was my biggest dream. Everyone thinks I’m kidding when I say that”), Jessica Michibata spent the majority of her teen years struggling to carve out a place for herself within Japan’s cutthroat modeling scene. It wasn’t until she appeared in a television spot for UNIQLO -- Japan’s leading clothing retail chain -- that Jessica Michibata first broke through into the mainstream, and she subsequently managed to land a series of high profile gigs modeling for such familiar names as Evian, Reebok and Seiko. Jessica Michibata’s growing success as a model allowed her to dip her toes into a variety of other endeavors, with her passion for cinema resulting in a four-year gig as a movie columnist for Soup magazine, which eventually led to a job introducing movies on the American TV station TBS as part of their weekly “Cinema Style” series. She’s also begun using her fame as a means of giving back globally, with her interest in helping developing nations -- via the Office of the United Nations High Commissioner for Refugees -- certainly emblematic of Jessica Michibata’s desire to help others. Despite all her accomplishments, Jessica Michibata is best known for her recent coupling with international racing sensation Jenson Button. As one of the most talented young faces on the Formula One, Jenson Button has been connected to a string of beautiful ladies – including model Florence Brudenell-Bruce and actress Louise Griffiths -- yet it’s his relationship with Jessica Michibata that’s transformed the pair into an international tabloid sensation. The couple made headlines across the globe earlier this year after they kept journalists waiting 15 minutes while celebrating his victory at the Australian Grand Prix in his trailer, with his explanation (“It got a bit steamy in there”) setting off a firestorm of speculation and raised eyebrows. It gives new meaning to 15 minutes of fame. It’s not surprising to note that Jessica Michibata’s profile has only grown in recent months, with her appearance at Japan’s semiannual Tokyo Girls Collection event drawing a crowd of over 22,000 enthusiastic fashion fans. She’s even had the chance to work with her model sister, Angelica, as the two have appeared in campaigns for the lingerie brand Peach John." Sorry... I liked this biography better!